The SASH program successfully launched 36½ panels statewide as of December 2013 with further expansion expected in 2014. A primary goal of the SASH program has been to create linkages with a diverse team of service, health care, and housing providers enabling better coordination of care for SASH program participants. Property managers we interviewed felt they were better able to perform their primary function because the SASH program focused on the health and wellness of participants. It was also opined that SASH activities helped to create a better community within the property and that by addressing unmet needs among aging residents (e.g., falls prevention) the financial risk to their portfolios, such as property legal liabilities, were reduced. Thus, it was felt that the SASH program could reduce costs for housing properties. Despite the successful roll-out of the SASH program broadly across supported housing properties in Vermont, a number of operational challenges have existed. The rural nature of the state presents a number of logistical challenges with large geographic distances between properties or between participating properties and community residents; poor cellular service makes connection to the central data collection platform difficult; and limited public transportation for SASH staff and participants. A second challenge noted broadly across interviewees was the perceived needed work hours exceeds actual budgeted hours for the SASH staff, in general, but the wellness nurse, in particular. Third, the SASH program monitors the progress of its participants through Vermont's central clinical registry, DocSite, and is heavily reliant on its functionality. Lack of widespread adoption of the registry by practices has reduced the full potential for communication between SASH staff and providers, and a shut-down of DocSite for two months in 2013 negatively impacted program functioning. A fourth challenge was freezing program expansion in the fall of 2012. The SASH program relies heavily upon the Medicare program for financial support. Fewer than expected participating Medicare beneficiaries in the MAPCP Demonstration created a funding gap. The Medicare program subsequently increased the payment amount and expansion resumed in May 2013. The SASH intervention group for this evaluation memorandum consists of Medicare FFS beneficiaries residing in SASH properties who have also been attributed to practices participating in the Blueprint for Health and the MAPCP Demonstration from July 1, 2011 through June 30, 2013. Only SASH participants that have signed a consent form to allow the SASH program staff to share their personal identification and health information with others participating in the MAPCP Demonstration are included in this analysis. The SASH program sites included in this year's analysis are those that implemented the SASH program prior to July 1, 2013. Designated SASH sites include a range of non-profit affordable housing properties funded through a variety of sources, including HUD, LIHTC, USDA, and other sources available through the State of Vermont. Sites also include a few mobile home parks. This current analysis includes only properties that receive funding assistance from HUD, which excludes important CSC properties because we do not have resident-level data available for LIHTC properties. In future analyses, we will be able to access data on LIHTC-funded properties and residents participating and will be able to expand our analyses to include these additional properties and residents. As of June 30, 2013, 1,502 Medicare FFS beneficiaries were participating in the SASH program. After applying a number of beneficiary and property exclusion filters as noted above, the SASH program sample for this analysis is 549 Medicare beneficiaries. The two primary reasons for exclusion include: (1) not being attributed to a MAPCP Demonstration practice as of June 30, 2013; and (2) a resident in non-HUD housing. We also experienced challenges linking residents with HUD data that requires further exploration prior to the next analysis. 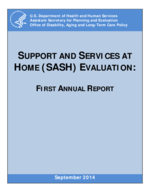 Thus, we may not have a representative sample of SASH participants in our current analysis; however, a comparison of health status and demographic characteristics of SASH participants with Medicare beneficiaries not included in the analysis found them to be similar. Further, the small sample size of SASH participants and the large amount of variation in the observed outcomes produced large standard errors and confidence intervals limiting the outcomes that we could study for this report and reducing the precision of the regression estimates. Despite these limitations, we observe that among early participants the SASH program was associated with a slower rate of growth in total Medicare expenditures and expenditures for post-acute care among SASH participants residing in SASH properties that implemented their program within the first nine months after the launch of the MAPCP Demonstration and relative to both comparison groups. The SASH program was also associated with a lower rate of growth in acute care payments among participants residing in the early SASH panels but relative only to beneficiaries in the non-SASH/non-MAPCP Demonstration group suggesting a possible synergistic effect of the MAPCP Demonstration and the SASH program. Medicare expenditures for hospital outpatient department services increased among SASH participants residing in the early SASH panels relative only to beneficiaries in the non-SASH/non-MAPCP Demonstration group, and may reflect identification of previously unmet need by both the SASH program and MAPCP Demonstration providers. When combining the beneficiaries from the early and late SASH panels, we observe the rate of growth among the SASH program participants' Medicare expenditures trending lower in seven of the ten payment categories; however, none reach statistical significance at this point in the demonstration. Despite the findings with respect to reduced rates of growth in Medicare expenditures, we do observe higher rates of hospitalizations and ER visits among SASH participants relative to non-SASH/MAPCP Demonstration beneficiaries. Further exploration of the reasons for the high rates of admission is warranted. Additionally, the analysis did not account for programmatic investments provided by the Medicare program to determine if the SASH program resulted in net savings for the Medicare program. The findings of the SASH evaluation thus far raise further questions. Impact estimates are based on the first year of SASH implementation only and are thus preliminary. Furthermore, although SASH participants had higher rates of hospitalizations and ER visits relative to non-SASH/MAPCP Demonstration beneficiaries, the early SASH panels were associated with lower rates of growth in Medicare expenditures relative to a comparison group. Future analyses will explore in more detail the costs of administering the SASH program relative to benefits that accrue to participants in the SASH program and the impact of on Medicare and Medicaid expenditures.